As all parents will attest, kids come with a lot of STUFF. That is, they don't come into the world with a lot of stuff, but they certainly do accumulate a lot of stuff: clothes, toys, appliances. Once you're done with all this stuff, though, it's a good idea to get rid of it. I've always been a fan of handing down, or donating to someone in need, but it would be great to make some money off some of it too, right? Well, you're in luck, fellow Vaughan residents! Boomerang Kids recently opened in our City and they buy and sell your gently used clothing, toys, gadgets and maternity wear. I was able to visit the brand new location at their grand opening this weekend. Boomerang is an Ottawa-based company that has been around for 20 years. This Vaughan location is the first in the GTA, and franchise is quickly growing. I consider it a consignment boutique, versus an ordinary consignment shop or thrift store. 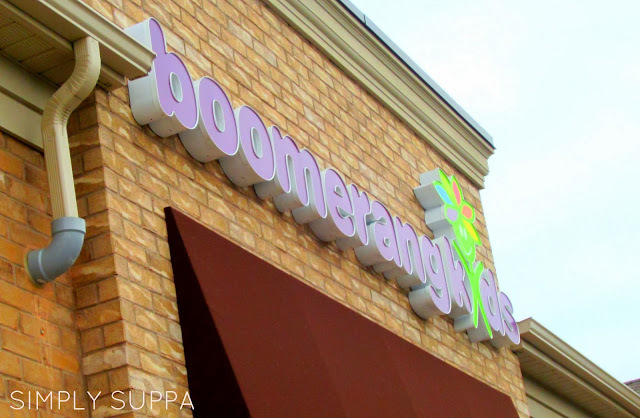 Boomerang Kids is bright and well lit, and while they may have a reputation of being "selective" or "picky", (these words coming from their rep) this ensures quality merchandise for shoppers. The clothing and toys in the store are clean, free of stains and in great condition. Consignors have the option of taking a direct payout for the merchandise they bring into the store, or opening up a consignment account. When you bring in your lot, the store representatives will select the items they need and price them according to condition. As indicated in the Terms and Conditions, consignors will receive 40% of the final selling price of all items and 50% for baby equipment (like strollers, cribs, etc). Once you register, the store sends out emails every few weeks to its database mentioning the items they're looking for, or current sales. Boomerang Kids also has a selection of new items, including toys, winter gear like hats and mitts, games and a great selection of Melissa & Doug Halloween costumes that are brand new and priced very well. If you haven't purchased a costume yet, this is a good place to go. Construction workers, pirates, firefighters, doctors - full costumes and accessories to boot! What I loved most about the store, though, is the fact that every item is bar coded and scanned; the plan for the store is to photograph each item and place it on the online directory so you can purchase online. Very advanced for a consignment shop! Consignors also have the ability to access their account and see how their items are doing in the store, or how much they sold for. What else do I love? Boomerang Kids is being super generous to Simply Suppa readers. If you bring in any items to consign before October 31, 2013, the store will add $5.00 to your store credit. Plus, I'll be giving away a $50 credit to be used in the store! For more info on the contest, just fill out the Rafflecopter below. Happy shopping and consigning! I have shopped at a consignment store lots when the kids were little! Such a great way to pay a fraction of retail. I think consignment stores are amazing for kids' clothes and products. They grow so fast they hardly have time to wear some items. Recycling at its best. Boomerang Kids looks like a great option.